We invite you to attend our worship services, or to join in some of our other activities. We belong to the Heartland Presbytery of the Presbyterian Church USA. As a part of this group of reformed heritage Christian churches we proclaim a "Reformed Faith - Always Reforming." We generally have communion on the first Sunday of the month or in accordance with special liturgical dates (ex. Christmas Eve). We have an open table which means we welcome all baptized believers to partake in this sacrament with us. 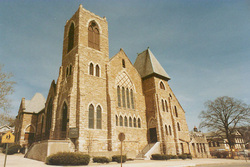 First Presbyterian Church of Atchison, KS is a welcoming PC(USA) congregation whose mission is to spread the good news of Jesus Christ. We seek to be faithful to God's call for each of us in our lives and to share the grace and love of God through our ministry and mission. Looking outside of ourselves, we seek to serve and care for all of God's creation. As the body of Christ, we covenant with God and with each other to affirm our unity in Jesus Christ and share Christ's ministry with others as the Holy Spirit leads us.